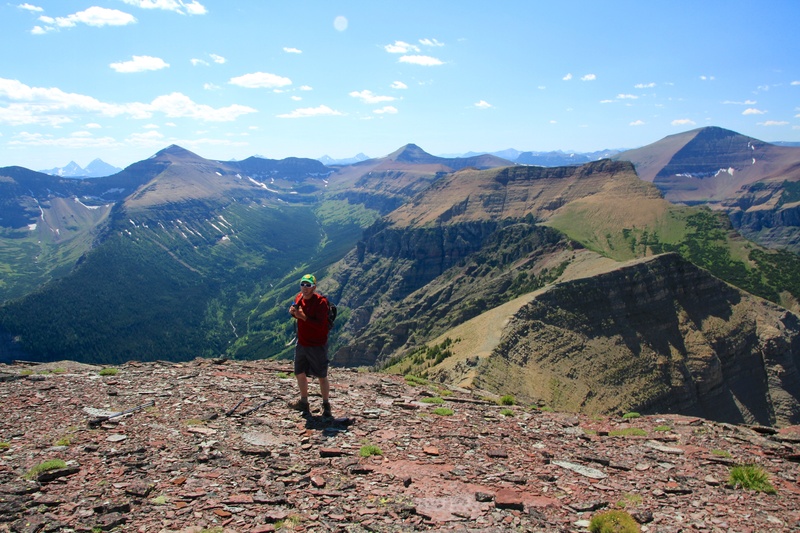 Just outside of the northern boundary of Waterton National Park, sits Spread Eagle Mountain (a.k.a. Mount Roche) which is the unofficial name given to this, the eastern end of Spionkop Ridge. 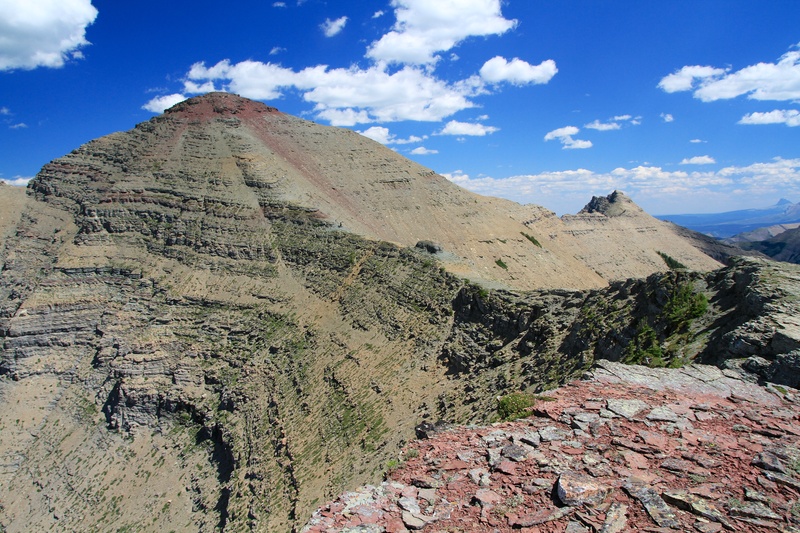 Last year, Jeff and I ascended the highest peak on Spionkop Ridge which is located on the western end. Here, we marvelled at the immense beauty of the Spionkop Valley and decided that we were going to return to Spionkop Ridge and hike to the summit of Spread Eagle Mountain. 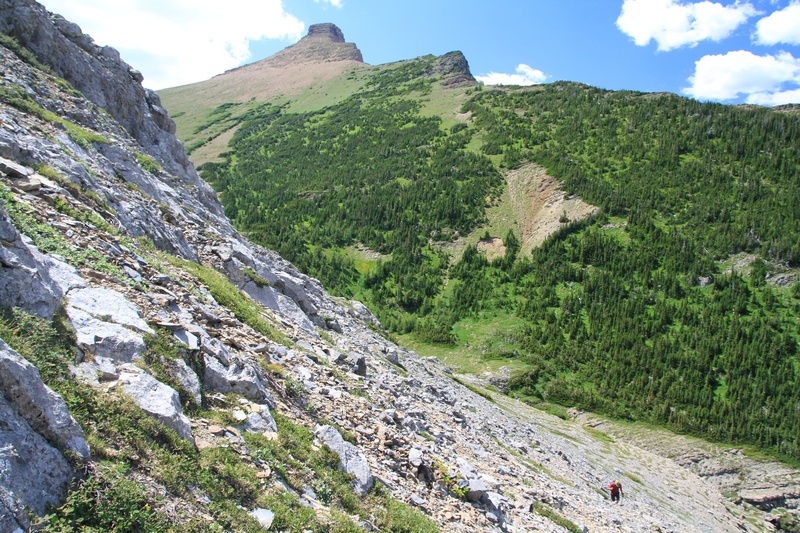 In, More Scrambles in the Canadian Rockies, Andrew Nugara describes a scrambling route that runs from right to left in the above picture. 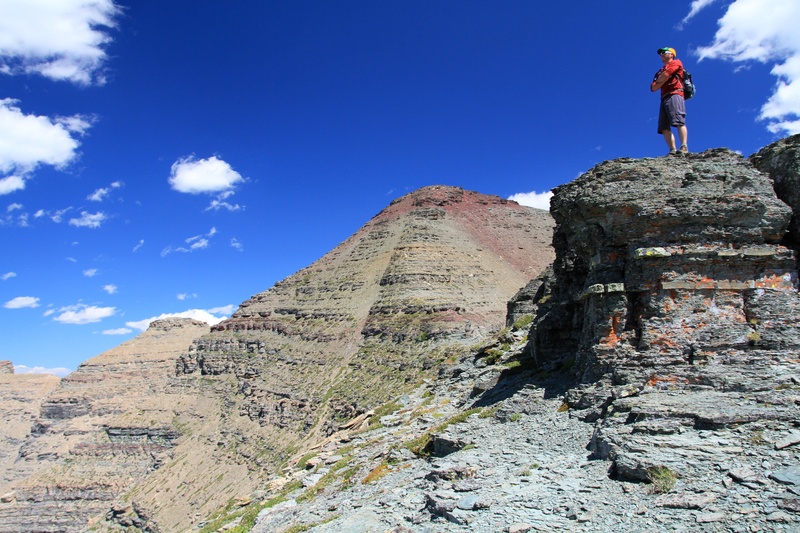 He ascended the two bumps on the right and then worked his way up increasingly difficult terrain until the summit. 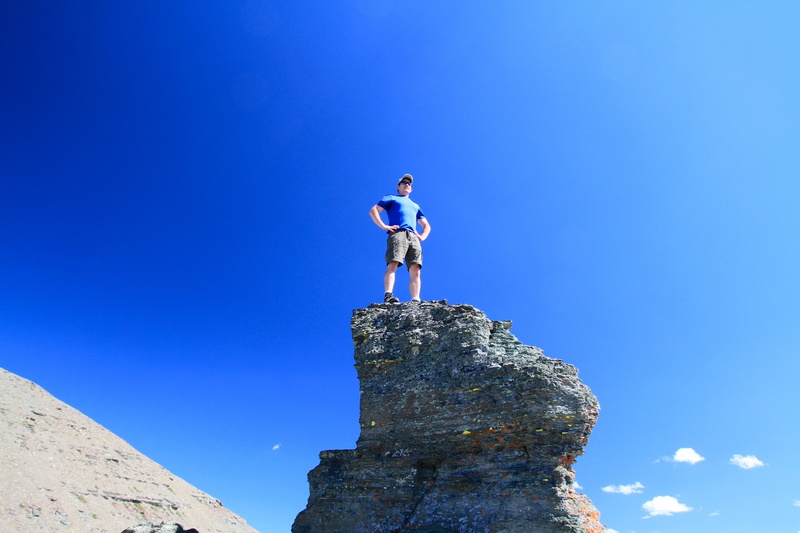 He also describes how he negotiated a particularly tricky and exposed crux before the summit. We seriously considered doing this route, but then discovered that Bob Spirko and others had used Nugara’s descent route as their ascent route. 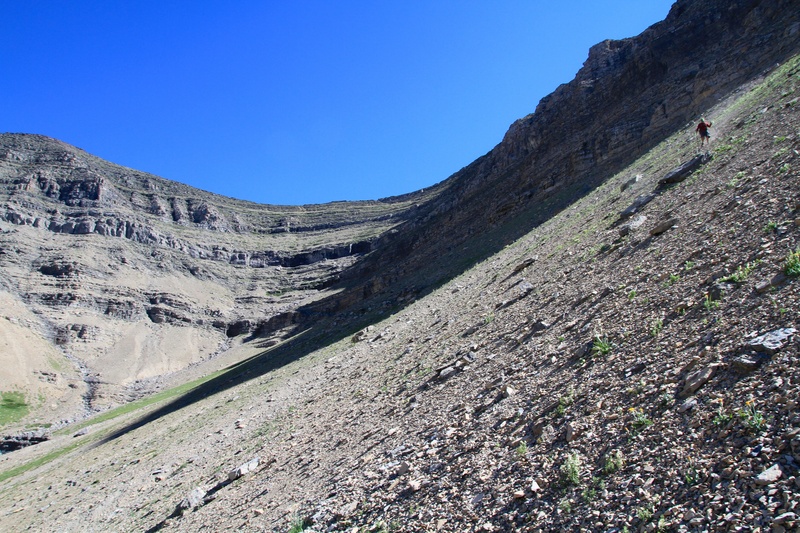 We decided that this was what we were going to do as well – though we also decided that we were going to change things up a bit and blaze our own route to the hanging valley, as the thought of scree bashing up from the drainage was not appealing. 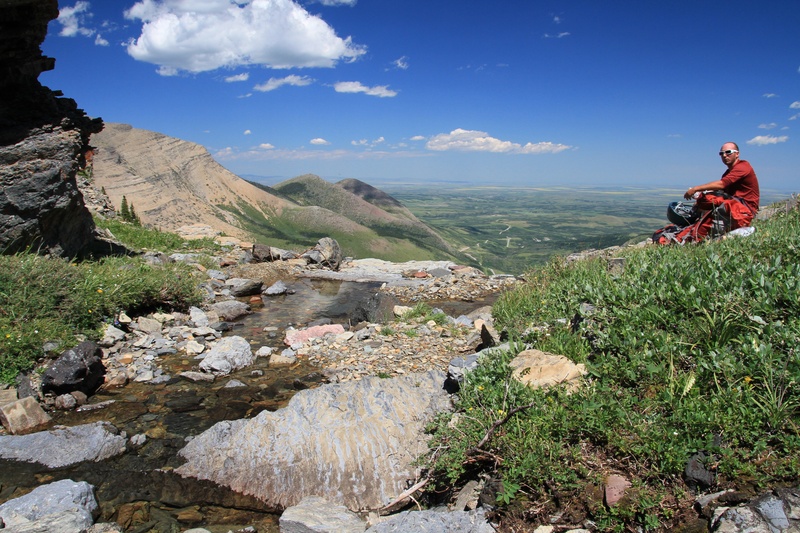 After studying pictures of Nugara’s descent route and Bob Spirko’s ascent route, I thought that an alternate route that would avoid scree bashing could be found just west of the drainage and up the slopes immediately behind a gas flare. Once up these slopes, we would work our way below the outlying cliffs of the unamed peak (GR149551) which lies west of Spread Eagle’s summit. I hoped that by doing this, we would intersect with the hanging valley where we could then rejoin Nugara’s/Spirko’s route. On return, the plan was to use Nugara’s/Spirko’s route down and out through the drainage. 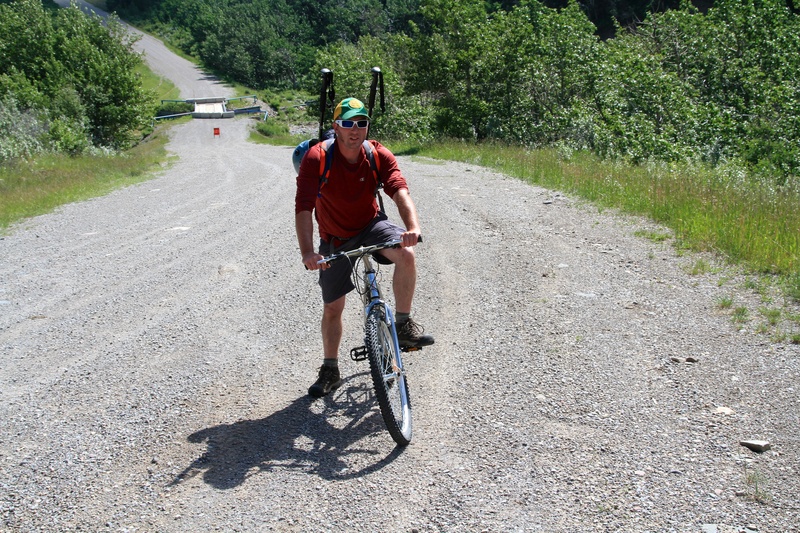 We also decided that because of the long approach, we would bring bikes to ride along the gas road. We would then ditch them near the drainage gully so that they would be ready for our return. Here is where our plan almost went awry, as Jeff discovered on the morning of our trip, that his bike needed some repair work. 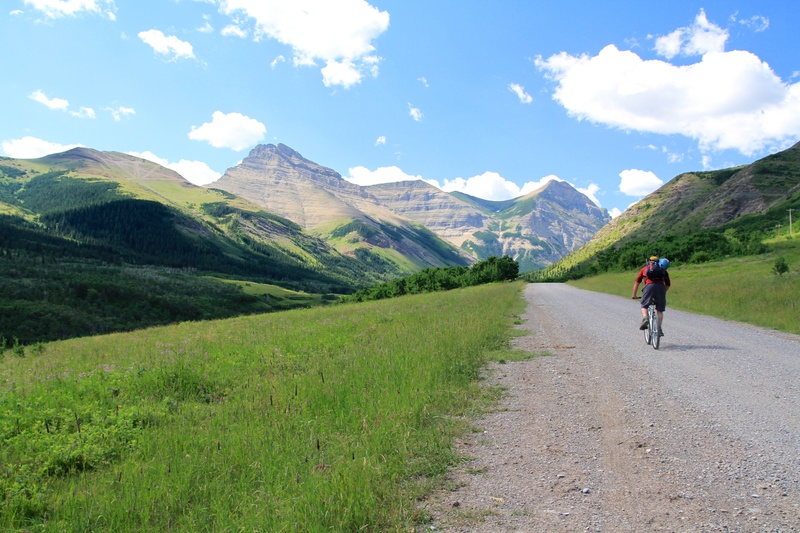 However, some skilled and speedy work by the folks at Bert & Mac’s Cycle in Lethbridge, put us back on the road toward Spread Eagle Mountain, albiet 2 hours later than what we had originally planned. 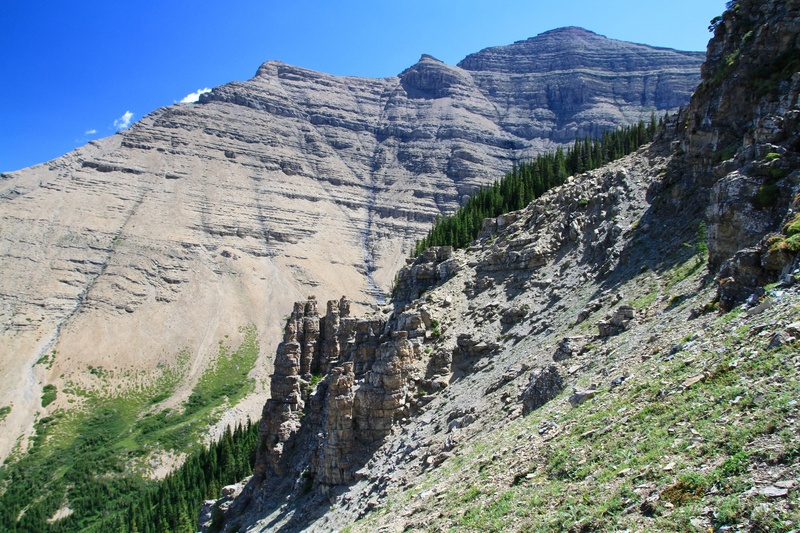 This meant that our secondary goal of scrambling along the southern ridge to Mount Yarrow would have to be shelved. Bringing the bikes was definitely the right decision given our late start and because the bridge over the creek had been closed due to recent flooding, which added an extra kilometre to the approach. We didn’t realize however, how much elevation gain there was along the road. 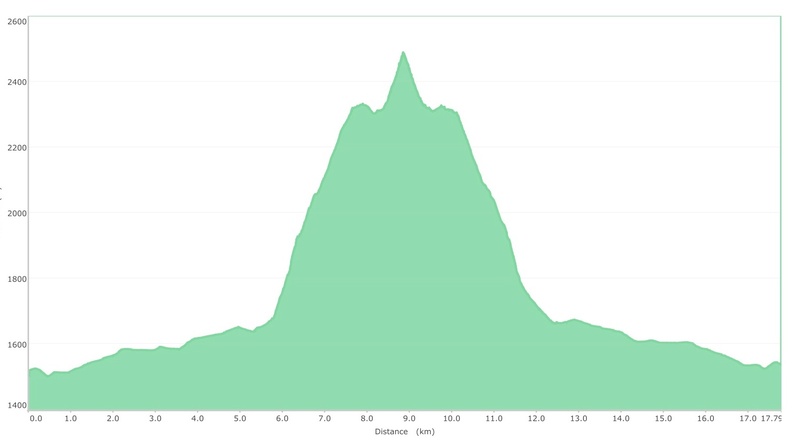 To our eyes, it didn’t look like there would be that much, and so when both of us were grunting and wondering why our legs were burning, I looked at my GPS and realized that we had gained well over 100m in elevation during the almost 5.5km approach. 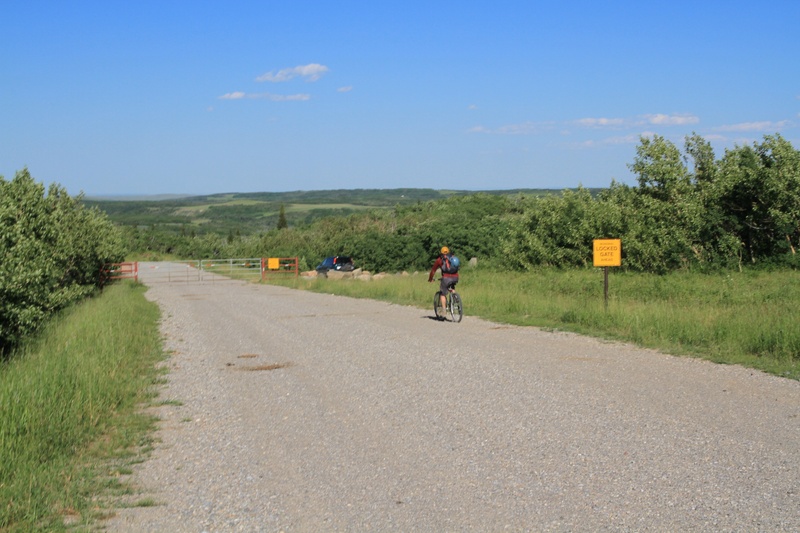 The bikes really paid for themselves on the way back, as we coasted rapidly (the GPS said we hit 48km/hr) back down the road toward the bridge. The total distance for the hike was 17.8km with a total elevation gain of 1139m. The total time was 6 hours and 36 minutes. Jeff on his patched up set of wheels. His bike was still unable to shift gears and he was stuck in one gear for the whole ride up the road. Behind him you can see the blockaded bridge over the creek. This added another 1km to the trip, but after examining the extent of the erosion around the bridge, it was fairly obvious as to why it had been closed. Actually, I was amazed that it was still there after the recent flooding. Riding along the gas road to Spread Eagle Mountain. The summit is just behind the highest point to the left of centre. There is also some kind of “Blair Witch Project” marking on the ridge to the left of the summit. A view of our starting and ending point. The ascent route that we decided to try goes up the grassy slopes and through the rock band in the trees on the right side of the picture. We would then work our way beneath the high cliff walls to the hanging valley in the centre. Our descent route would follow Nugara’s route beneath the rock band on the centre bump and down the scree slopes and out the large drainage just to the left of centre. Looking down at our starting point as Jeff works his way up. Glancing north toward the east end of Loaf Mountain as Jeff makes his way out of the small gully that we used to get through the initial rock band. WARNING! 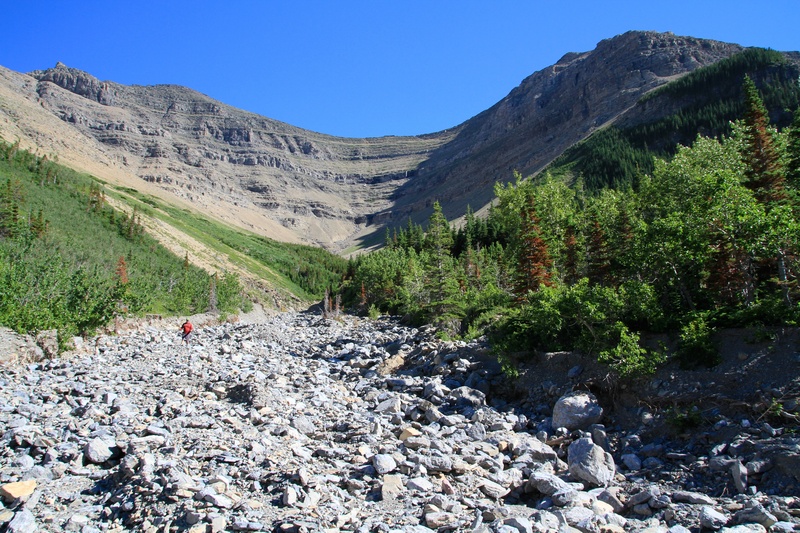 The terrain immediately above the gully is unstable and full of loose rocks that will become dislodged and tumble down into the gully. This could potentially cause serious harm or kill anyone who is still in the gully. 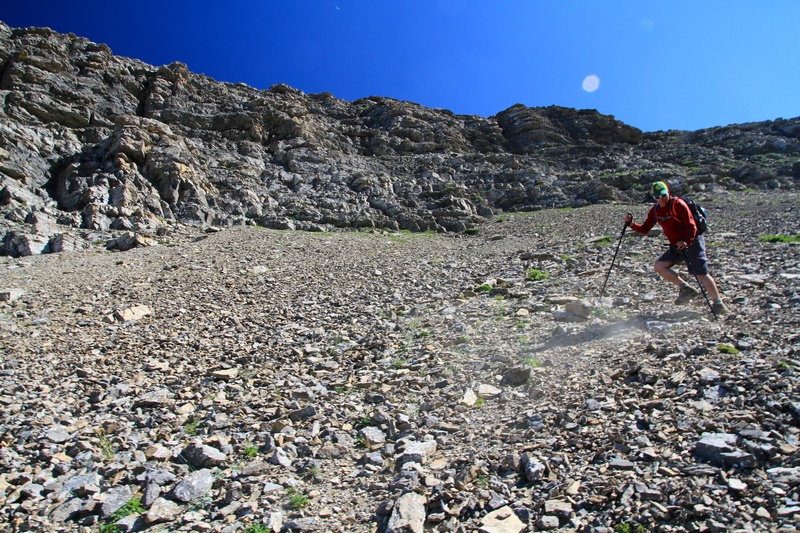 If you go this route, do not attempt to ascend beyond the top of the gully while others other are still working their way up! There are some incredible rock formations along this route. 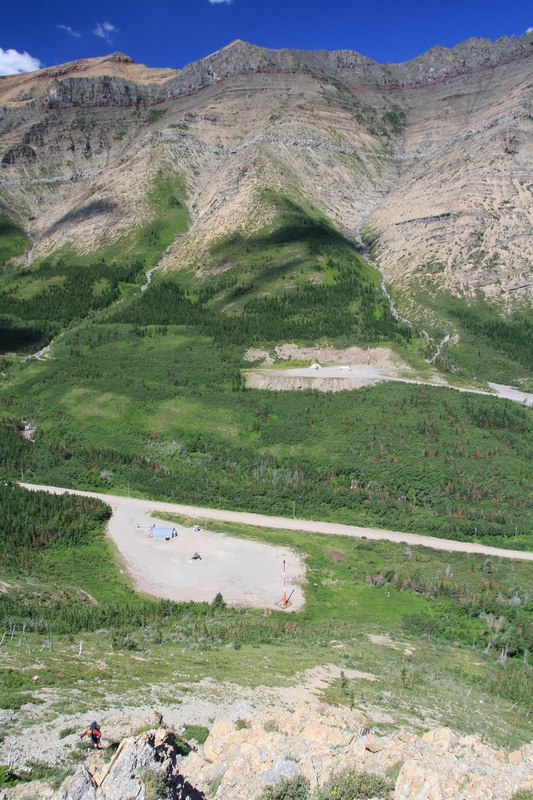 The summit of Spread Eagle Mountain is on the right. 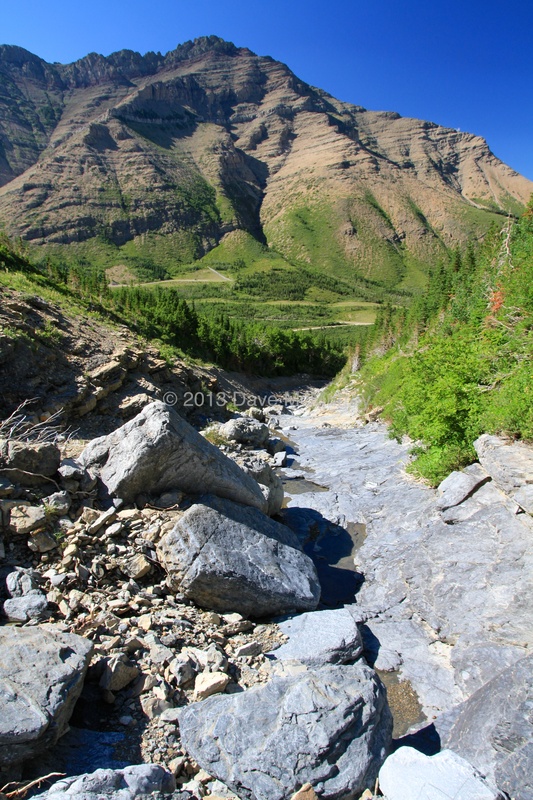 The drainage coming off of the hanging valley is quite deep and would require losing large amounts of elevation to cross. 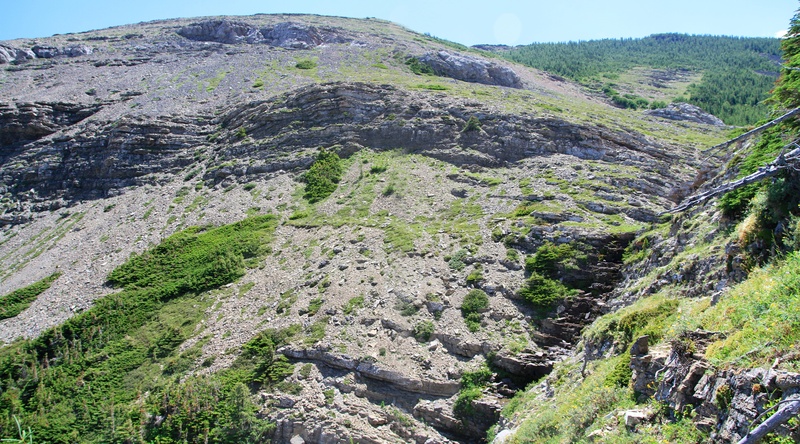 However, if you follow along the slopes beneath the outlying cliffs of GR149551 you will come to the entrance of the hanging valley (right) and an easy crossing of the drainage to the other side. Our route would go up the rock bands in the centre and up to the summit ridge. You could also stay to the right and go up next to the larches. Enjoying lunch (and the view!) from the entrance to the hanging valley. This view is looking northeast toward the east end of Loaf Mountain and the prairies. Our plan to avoid slogging up scree worked! 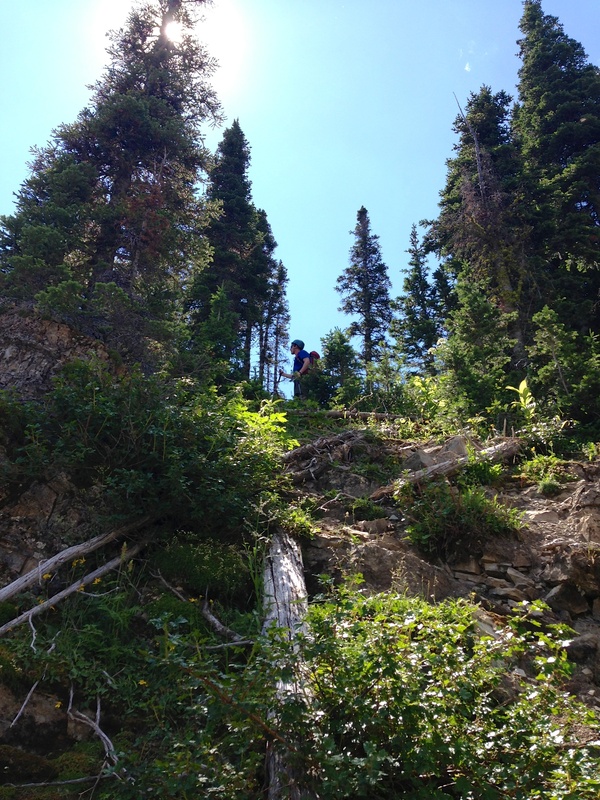 Jeff works his way out of the hanging valley and up the steep slopes toward the summit ridge. GR149551 is the box-like peak in the background. The summit of Spread Eagle Mountain as viewed from the northern slopes. This is the view that greeted us once we hit the summit ridge. 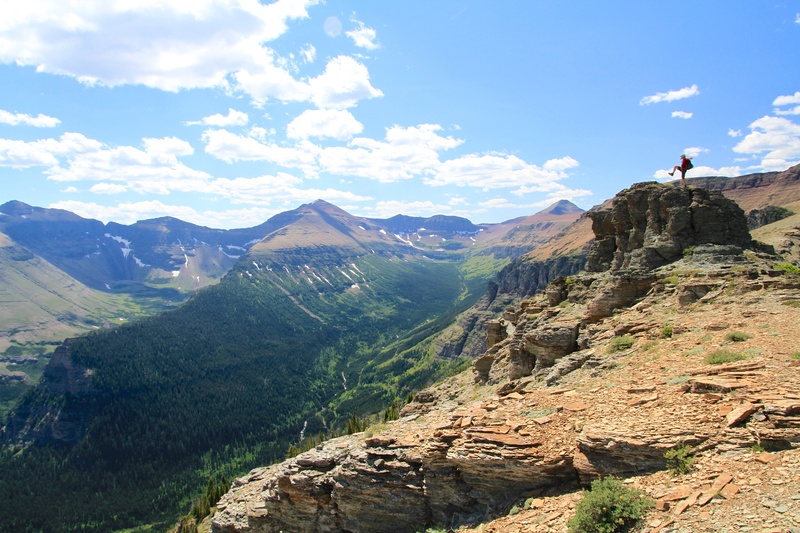 It is looking southeast and into Waterton National Park. 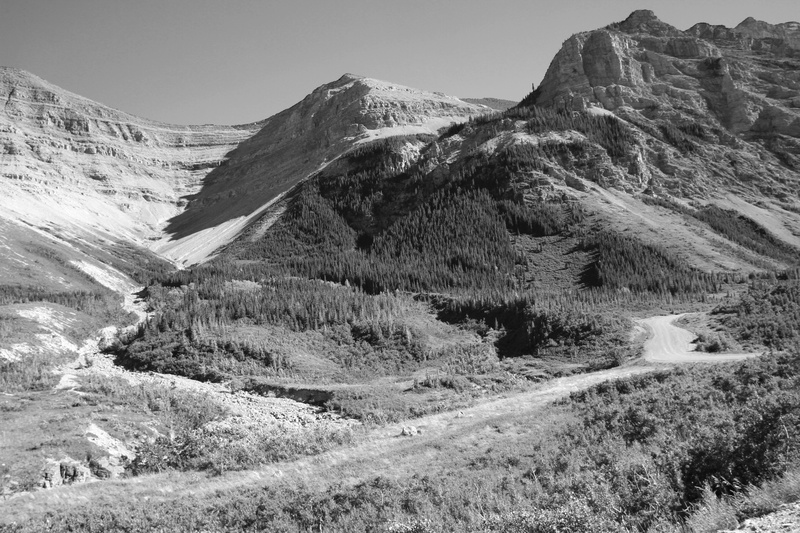 Mount Yarrow (attached to Spread Eagle Mountain) is on the left and Cloudy Ridge is in the centre. Way off in the distant centre, you can see Ninastako (Chief Mountain). Looking toward the summit from the ridge. It is fairly straightforward from here. Mount Yarrow is the smaller point on the right. Jeff with the summit of Spread Eagle Mountain behind him. 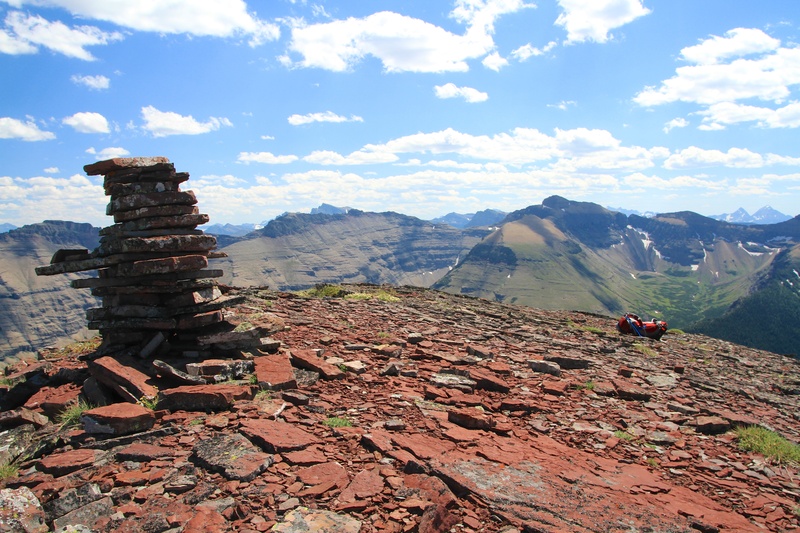 The large summit cairn of Spread Eagle Mountain (Mount Roche). The surrounding red argillite makes for a colourful platform. 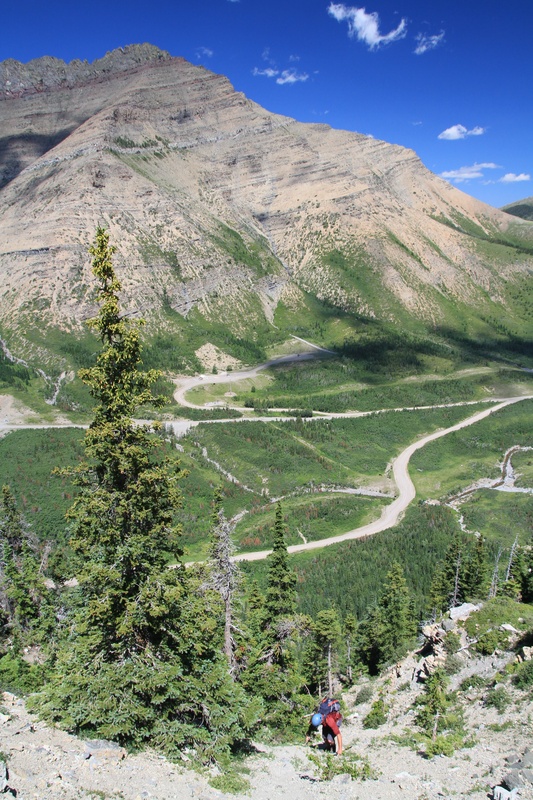 The view to the south and into Waterton National Park from the summit. Sofa Mountain is in the distance on the far left and Mount Yarrow is in the foreground on the left. Due to our late start, we had to forgo hiking over to its summit. Cloudy Ridge is in the centre and in the distant centre is Mount Galwey. The view to the west. 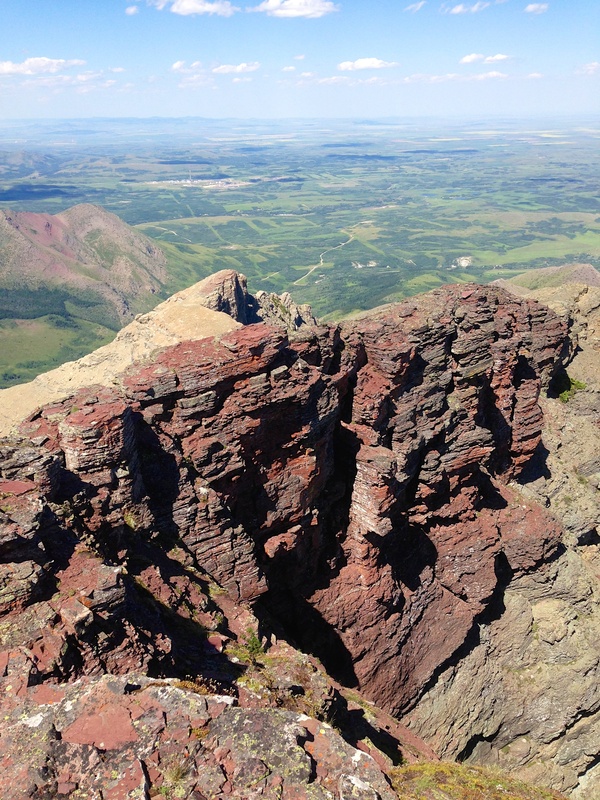 Newman Peak in Waterton National Park is in the centre. The summit of Spionkop Ridge is in the distant centre right. The summit of Loaf Mountain is on the far right. Gazing back along the summit ridge to the west. Our descent route would go down the scree slopes beneath the cliffs on the lower right hand side and out the drainage to the road. The view from the summit to the north. Loaf Mountain is on the left. Victoria Peak is in the distant centre. The view east from the summit toward Lethbridge. 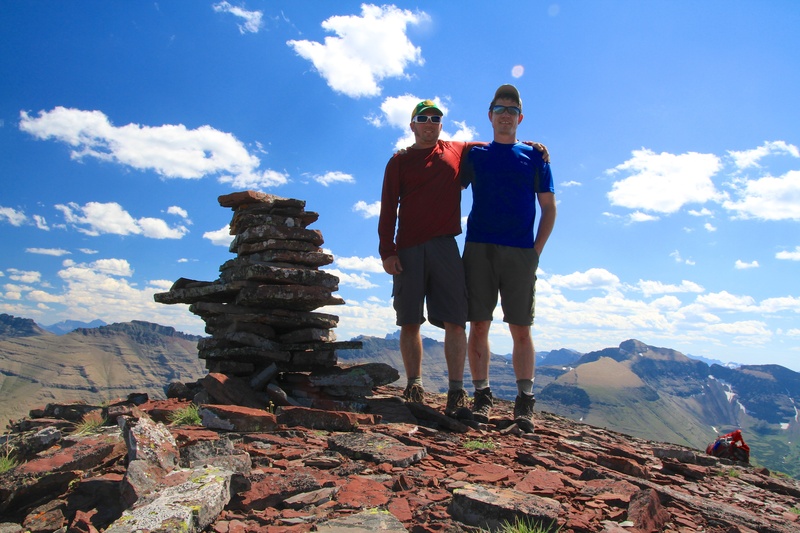 Jeff and I on the summit of Spread Eagle Mountain (Mount Roche). Ninja-like moves were apparently a theme for Jeff on this day….. Don’t worry though. 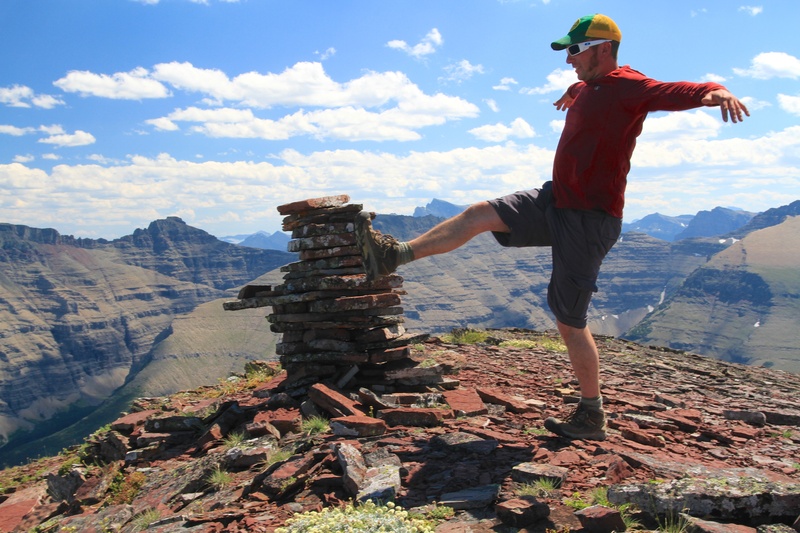 No cairns were harmed in the making of this picture. 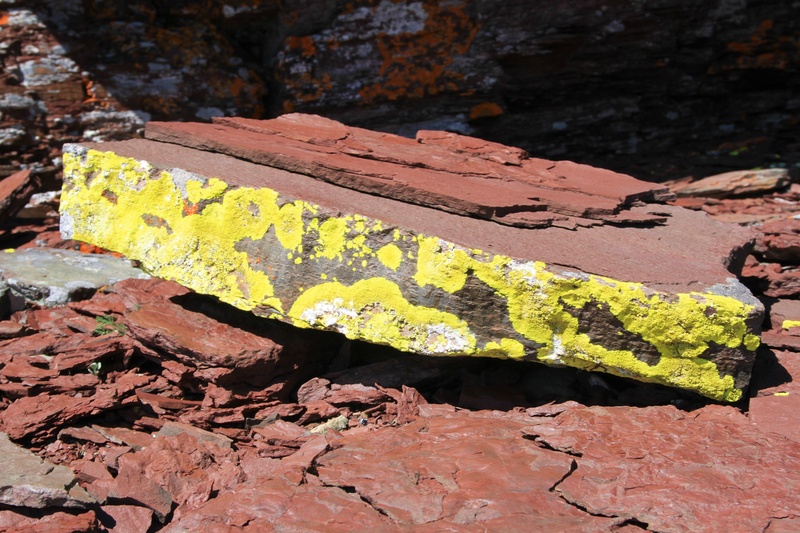 Colourful lichen on red argillite. 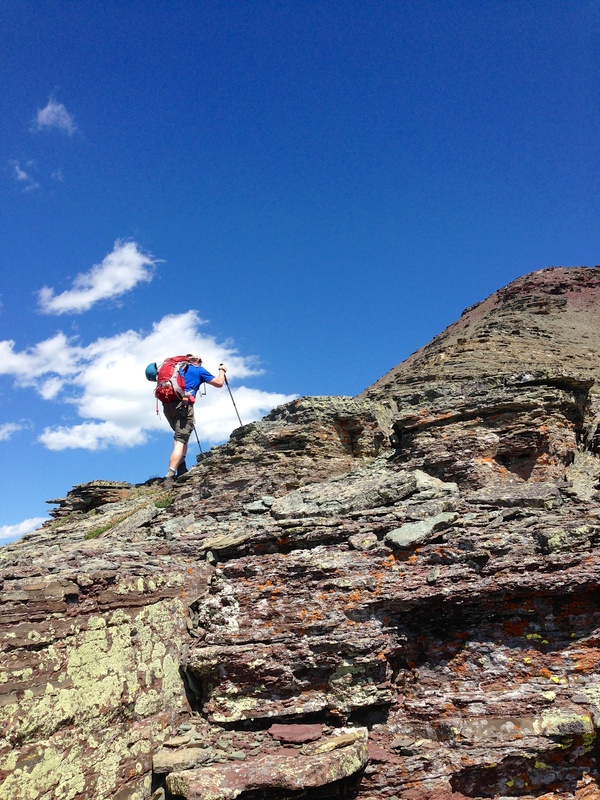 Jeff uses some of his ninja-like dexterity while he comes down from Spread Eagle’s summit. Looking back toward the summit as we head home. 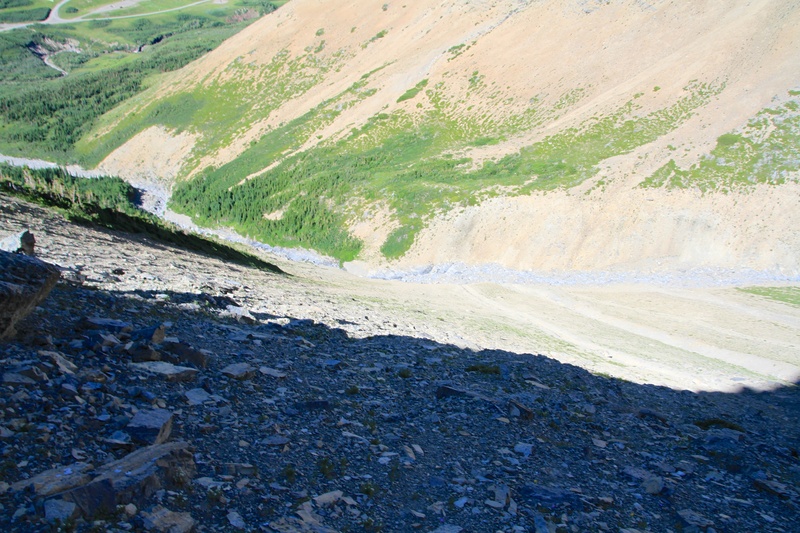 We went straight down this scree slope and out through the drainage below. Slogging up this scree slope is what we avoided with our ascent route. As per usual with the landscape in this area, the rock in the drainage was quite colourful. Jeff scree skis his way down. Looking down the colourful drainage toward the east end of Loaf Mountain and the gas road. Glancing back towards Spread Eagle Mountain as Jeff picks his way along the drainage. Arriving back at the vehicle after an awesome day of hiking. Despite our late start, we enjoyed every minute of the day – except perhaps for the long 5.5km uphill bike ride to where we began our ascent. Coming back however, we were grateful to have the bikes and enjoyed coasting at high rates of speed down the road.